Sorry for being two days late, but my phone connection went out for periods as they replaced some damaged lines here in the boonies between Sunday and late this afternoon. THERE HAVE BEEN MAJOR CHANGES MADE, SO READ THE FOLLOWING CAREFULLY! All future POW! Challenges will roughly follow the format below, unless otherwise noted for a special event. SPECIAL NOTE: For the next two challenges only, we are dropping the "C" challenge because of the two-month holiday period, which really makes things difficult for everybody. We'll go back to normal in January. In all cases, you can interpret the art any way you wish, and the more creatively, the better. Any media. B&W or Color, unless we specifically point out otherwise. Alright...you got Zombies...but with a hitch...to prevent a bunch of bazookas/rayguns blowing apart great-great-uncle Ned trying to eat your brains, the zombies must be in a historical era that predates 1850. Got that? No walking dead AFTER 1850. You can have cave people, ancient Egyptian or Viking zombies, even braining eating medieval nuns, but no zombie fights AFTER 1850, which means no nukes, light sabers or AK-47s. Hell, I don't care if your zombies are even human...I mean, zombie wombats fighting deported British criminals in Australia could be sooooo kewl...heeheehee. Either or Both-Deadline: Sunday, December 4, 2011, 11:59 pm anywhere in the world. You can present your solution as a minimum of THREE to any practical maximum you wish which adhere to standard comic specs as below...and, yes, you can have the first or last (or both) as a splash page if you want--just don't get TOO extreme on page counts. REMEMBER: You don't have to have a complete comic to qualify for polling--if you realize you're running out of time, try to get at least THREE pages finished by the deadline. That's all you need to qualify for polling..
WE NEED A BANNER/MASTHEAD/"LOGO" (whatever you wanna call it. It's our brand.) We'll decide the winner by poll, and if we decide we need more entries before polling, we will extend the deadline for this one for as long as it takes. This piece of art is forever, after all... or till last Tuesday--whichever comes last. • This is Top-Grade Art, so do your best. No rough sketches, WIPs, or jelly sandwiches will go to polling. • Size should be approximately 1000 pixels WIDE by 400 to 600 pixels HIGH. • The banner should present a clear idea of what P.O.W.! 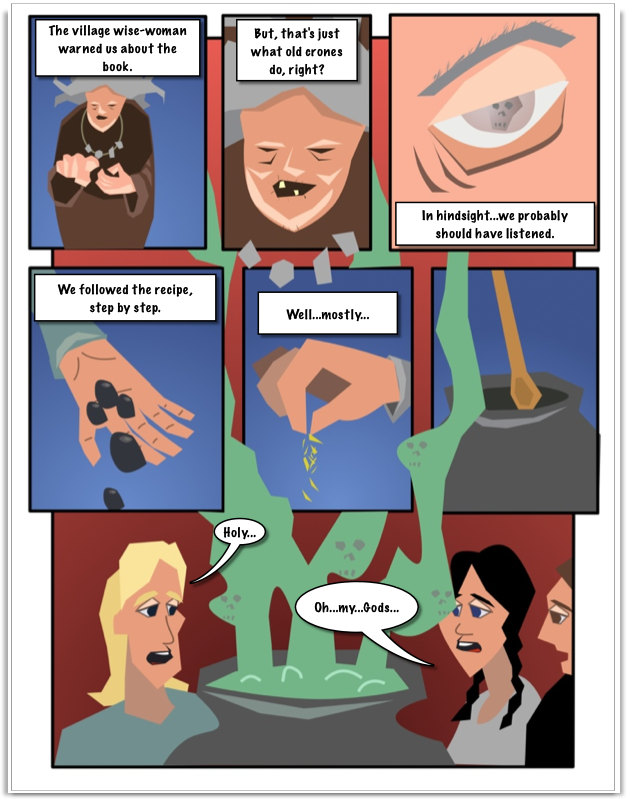 is all about--SEQUENTIAL PANEL (and other types of) COMICS-- and all that goes into producing them. Should be multi-color, and strong and clear in its message, which is "WE DO COMIX HERE!" • Unlike the other Challenges (COW, CHOW, TEEN, etc. ), we don't need an area for specs or "rules" for each individual challenge, because we're too diverse in approach to tie down to one set of specs. • What we DO need is the wording, "P.O.W.!" and "PANELS OF THE WEEK CHALLENGE." Nothing else is necessary, unless you want to continue the tradition of the tagline, "Created & Published by the @&$#!! Members of Conceptarts.Org Forums." Last edited by Ilaekae; November 8th, 2011 at 03:22 AM. There's a lot of room to mix the two topics up here as well. If they don't respond to this challenge, I think the pandering is definitely lost on the CA Crowd. How about Little Lulu - themed challenges into infinity? Also worth noting that you can get Popular Tales from the Norse for free for your Kindle, Kindle Smart Phone or Desktop App. That's 0 dollars and 0 cents folks - the research starts there. Anyway. Nice topic. I think I'll try to make something for this. Started sketching on a character... The idea is to have a girl sneak onboard a viking ship disguised as a boy so she can join the raids... Though I haven't really figured out anything more about the story than that. Here is my beautiful start. tobbA it's true that reading ebooks on screen can be wearing after a bit, but I still recommend the download - the stories are super-short, you can breeze through a few pages and get all the details of each myth. It's easier than getting the details off wikipedia anyhow. Your Viking Girl is looking nice. She might need a fake beard to pull off her disguise though! arttourney that is a beautiful start, heralding a triumphant return! Good to see you gracing these pages again. Thud the Re-Slayer! Arttorney Great start I'm definitely intrueged (or is it intreuged? meh!). Logo WIPS for opening page. Something seems to be wrong with Attachment Manager so I've posted them in an unorthodox fashion. For anyone who's looking for info about vikings this site I found (from a few seconds on google ) has loads of info on everything from clothing and weapons to history and daily life. I am so busy these days I will have no choice but to work on this daily, showing incremental progress. Large blocks of time will probably not be available. Daily work is probably the best way to go about these things anyway. Is it going to offend anyone if Thud is from the naked and hairy Homo habilis days? thanks for the ref tobba! I think I'll have to insist on it. Some work toward the first page. I'll probably create Thud last since I am still figuring out what file type to import to Vue that doesn't lose the texture (hair). You think Thud should live in 2001 Space Oddy land or something more mountainous and ice age looking? I got a leopard I can stick in here. Should Thud have a leopard sidekick? Last edited by arttorney; November 10th, 2011 at 09:26 AM. I'm pretty busy so had to skip last pow, but here i am again! for everyone I really can recommend the Edda, it's a collection of icelandic story and poems, just a great place for inspiration! donalfall: Both of the two scenarios would be great, although an army of Zombies on some undead Horses overrunning Hungary would be awsome!! Here is my first page. See that's what I said, ex-machina, but the people here IRL keep saying to go the other route. I like the idea of zombie Mongols. I think I've decided, cheers man. I really, really like the texture of your backgrounds in what you've posted - feels earthy, real. We'll see what the future holds for how far I can into this project... however, here's my start. I'm going to have to pick a year, hopefully Colorado was a territory before 1850 (I should know that since I grew up there and took CO history...), and of course research some period correct clothing to dress up the zombies, but other than I think I've got my idea nailed. Very much another tongue in cheek parody of a zombie apocalypse story. Hopefully its in the vain of "Return of the Living Dead" and "Shawn of the Dead"... Humorous in a dark way but very much in the spirit of zombie lore. Here is Thud without his club, wang, and hair. Last edited by arttorney; November 12th, 2011 at 12:19 PM. Nice find on the audiobook version, GRLILLO-GROD!. I'm going to go for the Mongol Invaders being the zombies, or at least the creators of zombies. The other way around is too similar to the book I just read. Sketching like crazy at work now. This is the logo to the top of the page. seems that my posts are moderated, and show up? Tank! Last edited by GRLILLO-GROD! ; November 13th, 2011 at 12:09 PM. Thud's merry band of friends threatened by a zombie. The Flaming Zombie- once a popular drink down at Trader Vic's, it has now taken on a more sinister flavor. (I want to make the flames a little more transparent.) I figured out how to change out the texture of a Makehuman model using Art of Illusion here. To give this guy a burned exterior I mapped alligator juniper bark onto him. Putting fur onto those other models is possible, now, because I have previously designed a fur texture in another Art of Illusion piece and I know how to copy textures between objects. I am still not sure if I will be able to import these textures into my Vue scene, but as a fall back position I can export the Vue Scene and composite everything in Blender. Last edited by arttorney; November 14th, 2011 at 10:07 AM. i went to a trader vic's once....hustled in like a sales shark and left a fat bloated shrimp! i really like your new look useing 3d. wip title : Historical comics 1923 presents - Vikings, where are they nowadays? Trying to create something completely on my ipad, but it's a bit of a bear working with some of the limitations of the platform. 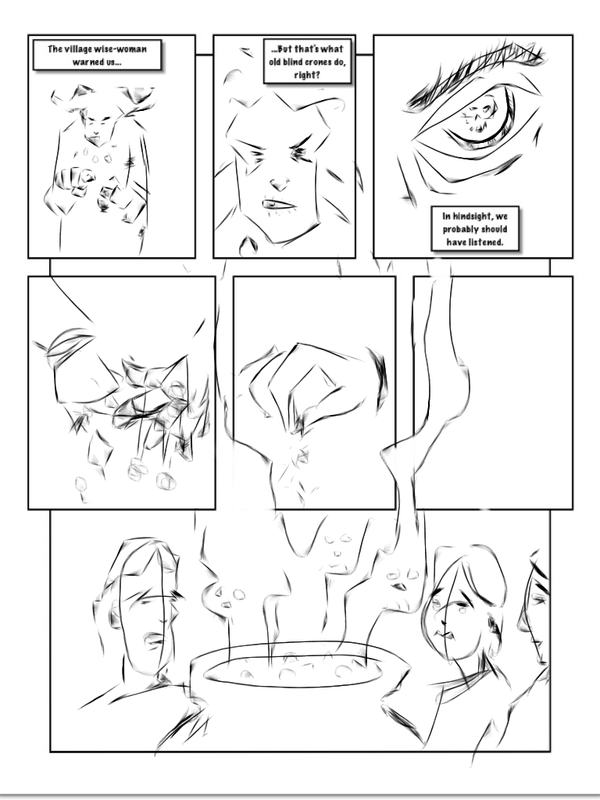 I started on one page and then realized I needed one before as well, but I'm new to making comics, so maybe I can figure out how to do it properly. EDIT...Hmm...sorry, not sure how to make the pictures any smaller. Last edited by Codexier; November 20th, 2011 at 08:12 AM. I guess I need to tone down the intensity of the fur a little bit, but here is the merry band with the first pass at their hairy texture. I'd say this is a little more like it. Here are three poses of Thud himself. Last edited by arttorney; November 21st, 2011 at 01:15 AM. Some amazing stuff rolling in here you guys. I've been checking in at work so i can't log in, but I can read the forum alright. R3u5 those sketches look like so much fun! The guy on the old style bike cracks me up. Codexier all on the iPad? Wow, that's really good man. Looking forward to seeing more. Ilaekae is looking for 3 pages this time, but if you get a second page to that quality in I'll slip you into the poll. arttorney the hairiest version of your merry band is funniest, but the less hairy versions are looking amazing. Pretty great. mongoosedog Hello and welcome! Your rough pages are looking great. Keep them coming. I've got 5 pages roughed now. I think that's the limit for me. Luckily I still have over 10 days left, but I still have to hit the ink hard the next few days. ..:: Vikings War - WIP::..